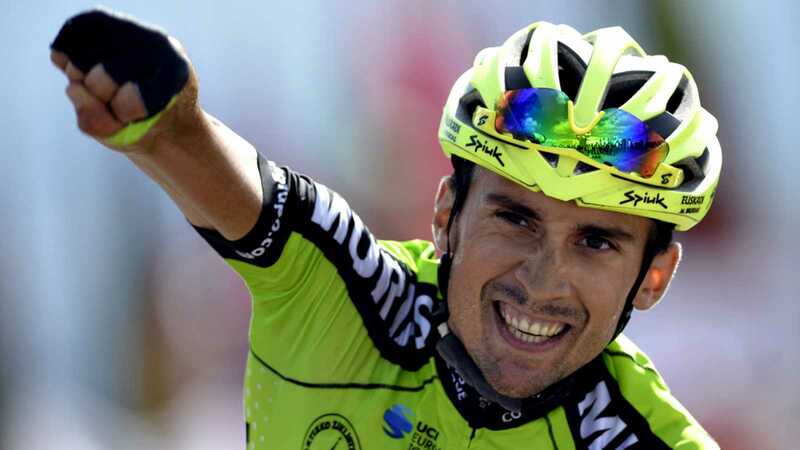 Óscar Rodríguez (Euskadi Murias) surprised both friends and foes with a stunning win during the thirteenth stage of the Tour between Candás (Asturias) and the peak of La Camperona (León), over a distance of 174.8 km. During the first of a triptych of Astur-Leonese mountain passes the favourites kept on their marks with meagre differences between them at the finish, but at 1,600 metres a star was born amongst team Euskadi Murias which took ultimate victory against its rivals following an attack that was pure strength and talent. The young 23-year-old Navarre cyclist proved his worth during the harsh final climb overcoming all of his rivals until he crossed the finish line. A milestone for the team during its fourth season in the peloton, and its first as a Professional Continental team. Their ninth victory, but the icing on the cake during an exceptional season. Rodríguez was ecstatic: “I still can’t believe it. I didn’t think it was within my reach, and less during La Vuelta. I had certainly reviewed the stage but didn't have it down as a win. To win against folks such as Valverde you have to be in the chase, which is not always possible no matter how hard you try. At the end of the day, it all worked out great, even better than I had expected. When Majka took off, I didn’t think I would be able to follow him to the top, I thought that I had lost him, but then managed to reel him in. When I levelled with him I noticed he didn’t look great, so I turned it up a bit and accelerated away". "I felt so happy crossing the finish line, happy for all of the people that had believed in me, for the team... for the many people who deserve it. I am going to enjoy this win to the full. Our team is on track but needs a little bit more help to become a great team. For me, it’s as if a new Euskaltel-Euskadi team has been born, a first-class team that fights in every race it enters”. Congratulations to the entire Murias-Euskadi team.